“I have a significant amount of time [both mine and others] and money invested in making this work. I am at my limits of abilities to work on it. I can get a display to run but no sound because of the Proz-mismatch. The PPG has the latest Virtual Music 8.3 ROMs. I am including a second set of ROMs as well. When this was shipped, the cards were not removed and wrapped so the damages are listed below. • LCD cable pins are bent / broken and some will need replacement. “PHYSICAL CONDITION : Excellent. The top, sides, and back have numerous small scratches and scuffs. The face plate is spotless and looks brand new. For the age, this unit has been very well cared for and is in amazing condition. “This was a Wave 2.2 that was upgraded to a 2.3 by the factory. The original unit did not have MIDI and wasn’t implemented during the upgrade. I installed a Kenton MIDI kit many years back that gives it basic MIDI functionality and served my needs well. I’m an experienced PPG repair tech that has revived Rupert Greenall’s infamous Wave 2.2 that appeared on all those great Fixx tracks and has been dead since the 80’s. Before I ship the unit, I will go through this, do a thorough cleaning and maintenance that includes calibration, cleaning of all contacts and aligning the keyboards action so they evenly trigger across the full range of the keyboard. No dead notes! “PPG Wave 2.3 is nice condition but has no audio output. Cosmetically it looks great with just some light scratches on the top. It powers up and appears to function ok. All the knobs seem to work (I can turn them and see values change on the display). Display looks great. I just can’t figure out how to get any sound out of it. It does appear to be sending MIDI signals fine, as I was able to play another synth using the PPG. I’m hoping someone can breathe some new life into this guy. I bought it locally from the original owner. I was planning to repair it but it’s been sitting in its case for a year and I’ve just got too many projects. I’m moving soon so I really need to downsize. “If you’ve been holding out for the best possible PPG WAVE 2.3 or 2.2, this is for you! Comes with a clean and seldom used flight case (also in excellent condition) and extra back-light panel (!) (This unit is still using the original backlight!) Also included is the original manual and a CD containing just about every PPG technical document ever published, along with an updated manual PDF, SYSEX libraries, schematics, etc. Note that I have restored all the original patches using the original SYSEX file. This is as close to a brand new unit as you’ll find. The unit is fully 100% functional and has been upgraded to the latest v.8.3 OS chips from Virtual Music. The unit has a few minor blemishes and has a slight “bend” to the left corner, but otherwise is in excellent condition. You would be hard pressed to find one in such great shape or working condition. As this instrument has the original (non) velocity and slightly “sticky” keyboard, using the MIDI IN will achieve midi velocity (!!!) as this unit contains the latest OS chip, plus SYSEX support, among other improvements. “Classic analog poly synth in good condition – check out the high quality photos I uploaded. Keyboard was re-bushed 2 years ago by a friend of mine, but he did not level out the keys. It is still very playable. Missing a few knob caps which can be purchased from Virtual Music in Vienna. etc etc. I’m sure there’s actually more – if you really want the details, ill dig out the paperwork. “A lovely piece of history in ridiculously good condition for a keyboard that has toured the world. (see flightcase pics) that has not been used for quite some time so it’s sadly time to part company. Was serviced prior to last use by Andy Thomas, the original UK importer of PPG equipment and was in fine voice, but as it has been off power for so long it will need you to sit down, get to know her and get her singing again – in my opinion the true joy of vintage kit! LOCAL PICKUP ONLY (in Hollywood) I don’t have a case or crate to ship this. This synth was serviced this month (April) by Ed Miller here in Hollywood. It is now in great working condition, no problems or issues. This is quite rare I guess, they only made a few thousand of these over thirty years ago. This belonged to a friend of mine who passed away. I believe he had owned it for about 20 years. It needed to be cleaned and otherwise tuned up, because I don’t think he had played it much in the past decade. Now it works just fine. It was not carried around to gigs, so it was not moved much.. and does not have a case. I do not know who originally purchased it in the 80s. It does have a light odor of cigarettes, that continues to fade. This has been tested by a friend of mine both before and after the tune up, and now it has no problems. I’ve tried to take pictures to show the condition and inputs. Let me know if there is something specific I’ve missed. If you have technical questions, I can probably get an answer for you. This synth was serviced in October 2013 by Ed Miller here in Hollywood. It is now in great working condition, no problems or issues. This is quite rare I guess, they only made a few thousand of these over thirty years ago. This belonged to a friend of mine who passed away. I believe he had owned it for about 20 years. It needed to be cleaned and otherwise tuned up, because I don’t think he had played it much in the past decade. Now it works just fine. It was not carried around to gigs, so it was not moved much.. and does not have a case. I do not know who originally purchased it in the 80s. It does have a light odor of cigarettes, that continues to fase. “PPG Wave 2.3 Perfectly Working Condition. Version 8.3 ROMs are installed. Comes with hard case, cable, version 8.3 manual and version 6.0 ROMs. A very rare vintage synthesizer, especially in this condition. Beautiful and warm sound. Mit dem neustem Bestriebssystem V8.3! Tolle Features wie z. B. der Sound/Datentausch zwischen dem Waldorf PPG Software Synthesizer und dem PPG WAVE. SYSEX Daten via MIDI. ” Here we have my PPG Wave 2.3 Keyboard/Synth in heavy duty flight case. Wave 2.3 (1984-1987) – 16 oscillators (two per voice), 12-bit resolution, dual modulation wheels, SSM 2044 VCFs, 8-part multimbrality. The PPG Wave could be connected to multiple peripheral PPG components simultaneously, such as a ‘smart’ keyboard controller (PRK), 8-voice expansion units (EVU), and a sampling/editing/sequencing wave computer (Waveterm). Collectively, this setup was referred to as the “PPG Wave System”, which was intended to compete with the Fairlight CMI. Aus Studioauflösung verkaufe ich ein PPG-System. 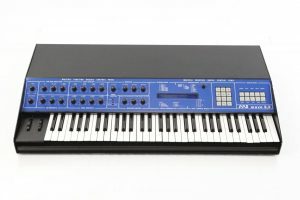 Es ist das klassische System bestehend aus PPG Wave 2.3 Synthesizer (ein aufgerüsteter 2.2, komplett bei PPG upgedated mit MIDI und beleuchtetem Display) und Waveterm B.
Beide Geräte funktionieren sehr gut, der Waveterm besitzt eine fast neue Röhre, leuchtet hell und klar. Die Laufwerke sind in Ordnung. Die komplette Library und alle Kabel sind natürlich dabei. ” Auction ended. Click here to browse on eBay. “This hard to find keyboard has been in a smoke free studio for years in an airtight case. It was recently serviced in Staten Island by Almarc Engineering. The PPG is being sold AS IS. Everything mechanically is in working order and it starts up. It needs work done on the digital side. All parts work just cleaned and serviced. Keys will have to be straightened but they are all working. You can hear the Oscillators working when correct code is punched in. ” Auction ended. Click here to browse on eBay. ” This listing is for a new PPG Wave 2.3 keyboard assembly. The connector pins that connects it to the main board were slightly damaged in storage but everything else is good to go (it would be a simple fix or replacement using the connector from your current keyboard.” Auction ended. Click here to browse on eBay. ” This classic PPG 2.3 is in good condition for its age and is working perfectly. Comes with genuine owners manual. ” Auction ended. Click here to browse on eBay. “Selling this superb condition PPG WAVE 2, serial number 7. Machine is in A+ condition for its age. Face plate has very minor wear. Keybushings have been replaced with a full new set. Keycontacts haven been cleaned, keys cleaned ad straightened. All potmeters haven been open cleaned and properly lubed. Lithium backup battery has been installed and factory presets loaded. Machine sounds very authentic, raw 8bit waves with analog CEM filter…..
As far as PPG products is concerned, it does not get any better than this! Comes with copied manual and copy of factory sounds on cassette.” Auction ended. Click here to browse on eBay. “Absolute Rarität!! PPG Wave 2.0, der legendäre Vorläufer der Wave 2.2 und 2.3 Modelle. Er ist äußerst selten! Besonderer Klang durch andere Analoge Filter- und VCA-Chips als bei den späteren Waves. Der Synthesizer ist mit MIDI-Interface nachgerüstet. Wofür die beiden ebenfalls später nachgerüsteten Taster links unten am Controlpanel sind, weiss ich nicht. Das Instrument ist aus einer Erbschaft und hat deutliche Gebrauchsspuren. Es funktioniert meines Erachtens aber einwandfrei. Mitgeliefert werden ein Handbuch, 2 Kassetten mit den Originalsounds und ein Tastatur-Reparatursatz, um die etwas “wellige” Tastatur wieder zu begradigen. Der Keyboardständer ist nicht Bestandteil der Auktion.” Auction ended. Click here to browse on eBay. “This listing is for a PPG Waveterm A 8 bit programmer/sampler for the the PPG Wave 2.2. The unit is 100% functional and is in nice cosmetic shape as well.” Auction ended. Click here to browse on eBay. 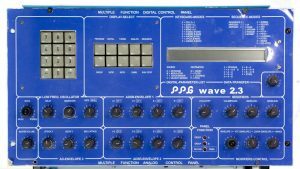 “This listing is for a clean PPG Wave 2.3 vintage wavetable synthesizer. The unit is 100% functional and it is in nice cosmetic shape as well. Lightly used and well maintained in a smoke free home studio. I just had the unit gone through. The battery was just replaced and keyboard contacts were cleaned as well.” Auction ended. Click here to browse on eBay. “This listing is for a rare PPG Wave 2 with MIDI. The synth is 100% functional and was just serviced. I had the back up battery replaced with a lithium one as well as getting the keyboard contacts cleaned. This is one of the few that has MIDI and it works great. In my opinion the 2.0 sounds much better than the 2.2 or 2.3 so while it may not be the prettiest PPG on the block it really stands out against the other revisions.” Auction ended. Click here to browse on eBay.